Blaine’s Michael Brodzinski emerged as one of the state’s promising young defensemen as a sophomore last season. USA Hockey officials have also taken note, offering Brodzinski a spot on the National Team Development Program Under-16 team. In March, Brodzinski scored an overtime goal in the section finals to send the Bengals to the state tournament. But it’s uncertain whether he will return as a junior or head to Ann Arbor, Mich.
“That’s the hard part now, losing two years with his high school buddies,” Mike said. Brodzinski, who measures 5-11, 180 pounds, scored 14 goals and added 17 assists last season. Hockey acumen runs in the family. Mike played for the Gophers then transferred to St. Cloud State. Older brother Jonny was a Mr. Hockey finalist as a senior last season. He committed to St. Cloud State. Brodzinski’s offer comes just months after he wasn’t invited to USA Hockey’s NTDP Final 40 camp in March. 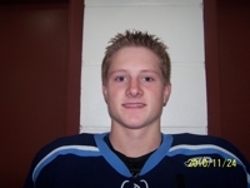 Other Minnesotans such as Hudson Fasching (Apple Valley), Gage Ausmus (East Grand Forks) and Brodzinski’s youth hockey teammate Luke Voltin (Hill-Murray) participated and later committed to the NTDP.